As a few of you know I have been in the infinite chore of sorting. We are making progress but I have hit a bump. I need something to break up the monotony of sorting. Any thoughts on what to do? I kinda have the itch to build something, but don't know what. 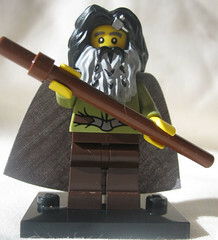 Only so far that the armchair Lego hobby can host before looking at article's about Lego, or the YouTube videos will go. What do you do to break up the flow? Build some minifigs for a fig barf. That should help to scratch the building itch without undoing any of your recent sorting efforts. - Figbarfing, as AK mentions. - Blackjack: Build something with no more than 21 parts (but as close to 21 as you can get). - Do a study. Graphical artists do studies of little details, like a mouth, and hand, the wing of a bird, etc. LEGO builders can do studies, too. Try a new frame for a door. A new outline for a window. A new motif to go under the machicolations of your next castle. A new type of crenellation. Maybe some running water. A new type of bush. A new type of tree. Your goal is to make something that you like well enough to incorporate into your next full-sized build, but not to turn it into a build of its own. You're just experimenting with techniques to see what works, and what ideas it gives you for your next build. Happy building, and productive sorting! Be honest Sean, you only wrote that response so that you could use the word, "machicolations", and we all know it!